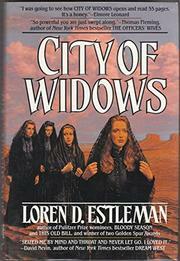  A somber, businesslike portrait of the 1880s American Southwest from the prolific Estleman (Whiskey River, 1990; etc.). Known to many as ``Satan's Sixgun,'' US Deputy Marshall Page Murdock is sent to New Mexico by Judge Harlan A. Blackthorne on the trail of the brothers Baronet--Frank, the corrupt but effective sheriff of Socorro county, and Ross, who is presumed dead. It seems that, in addition to running crooked games and robbing rivals, the Baronets also killed the man who saved the good judge's life during the Civil War. Murdock is the Fed likeliest to ``bring 'em back dead'' and thereby avoid messy trials. Frank, however, isn't one to go along peacefully, so Murdock must travel in the guise of a retired gunman turned part-owner of a saloon in nearby San Sabado- -or as the locals call it, Ciudad de Las Viudas, City of Widows. Subplots spring up like locoweed as Murdock discovers that his new partner is Colleen Bower, aka ``Poker Annie,'' a woman from out of his past. Further complicating matters is a robbery by a gang whose leader looks suspiciously like the late Ross. The stage is set for a showdown during which Murdock, naturally, learns a great deal about himself, Colleen, and Frank. Atmospheric and bleak, Estleman's story evokes the brutality and heat of the Southwest through the efficient actions and dialogue of its characters.